Lieve Watteeuw (°Brugge, 1959) started in 1989 as an expert conservator-restorer of books, manuscripts, archival and library materials. She attained her PhD in Art History at the KU Leuven in 2008. She lectures on codicology, medieval illuminated manuscripts and art-technical research. Her academic focus concentrates on miniatures, book archeology, art-technical research, analytical and imaging techniques, and long-term conservation/preservation strategies for heritage collections. For her innovative approach, she received the State Prize for Cultural Heritage from the Flemish Government in 2004, and was invited as a Scholar in Residence in the J.P. Getty Research Institute in 2010. She established the Book Heritage Lab (BHL) at the KU Leuven in 2016, an innovative expertise lab for research and conservation of manuscripts, early printed books and documentary heritage. As an expert in the study of the material characteristics of art and documentary artefacts, Lieve Watteeuw is currently the coordinator of the 3Pi Project (Diagnosis of Papyrus, Parchment and Paper through advances Imaging, FWO), the successor of the successful RICH project (Reflectance Imaging for Cultural Heritage, Hercules, FWO). Since 2016 she is co-promotor of the ArtGarden Project and the Fingerprint Project, both funded under Brain-Belspo. 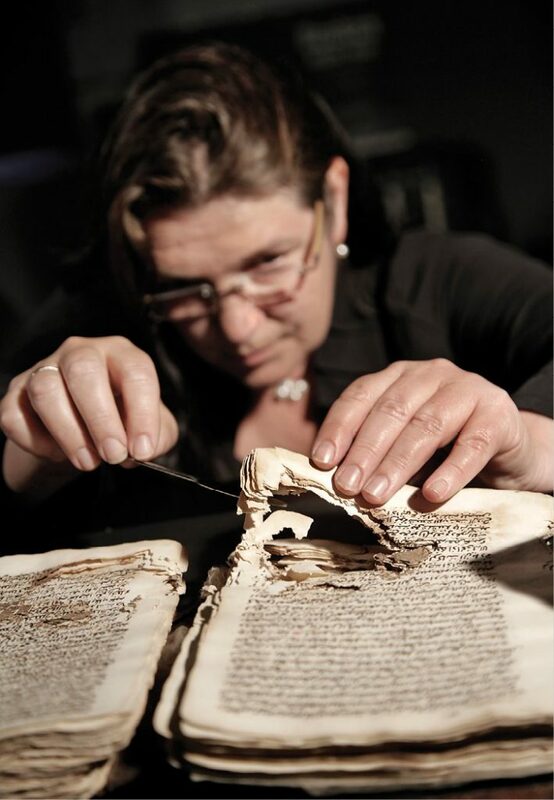 She is leading the Codex Eyckensis Project, the KU Leuven Charter Project and the conservation of the Illuminated Manuscripts from the Maurits Sabbe Library, KU Leuven, projects funded and in collaboration with the King Baudouin Foundation. She is currently publishing with ESAT and the University Library on the ‘portable light dome’ and imaging techniques on documentary heritage ( eg. 2018, Bridging multi-light & multi-spectral images to study, preserve and disseminate archival documents). Other contributions include her publications of the Catalogue of the Western Illuminated Manuscripts of the Universities of Leuven (Peeters, forthcoming) and a monograph on the Enclosed Gardens of Mechelen (The Enclosed Gardens of Mechelen. Late Medieval Paradise Gardens Revealed, Hannibal – UPA, 2018). In 2019 her research on the history of the restoration of medieval manuscripts The Touch of Chronos, will be published in the Corpus of Illuminated Manuscripts. Lieve Watteeuw was curator of the manuscript exhibition, The Bible of Anjou, a Royal Manuscript Revealed (Museum M, 2009), Magnificent Middle-Ages (Museum Plantin-Moretus, Antwerp, 2012), and the exhibitions of the Timbuktu Manuscripts (2015) and the Dendermonde Codex. Hildegard van Bingen in the Low Countries (2018), both at KU Leuven. She has collaborated as a conservation expert on several international exhibitions: Rogier van der Weyden, Leuven, 2009 and In search of Utopia, Leuven, 2016. She is affiliated to the Faculty of Arts and the Faculty of Theology and Religious Studies at KU Leuven. Lieve Watteeuw is an active collaborator and member of the International Council of Museums, Conservation Committees (ICOM CC), an international network of conservation scientist, museum professionals and heritage institutions.